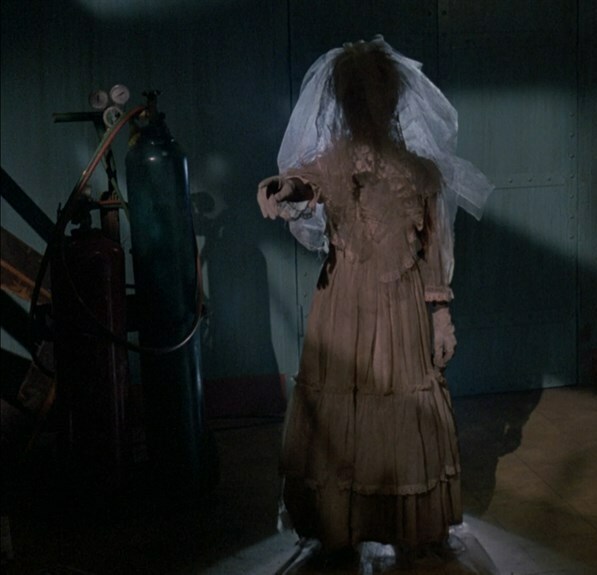 THE SERPENT AND THE RAINBOW: Making Nightmares Into Hollywood Voodoo – Schlockmania! 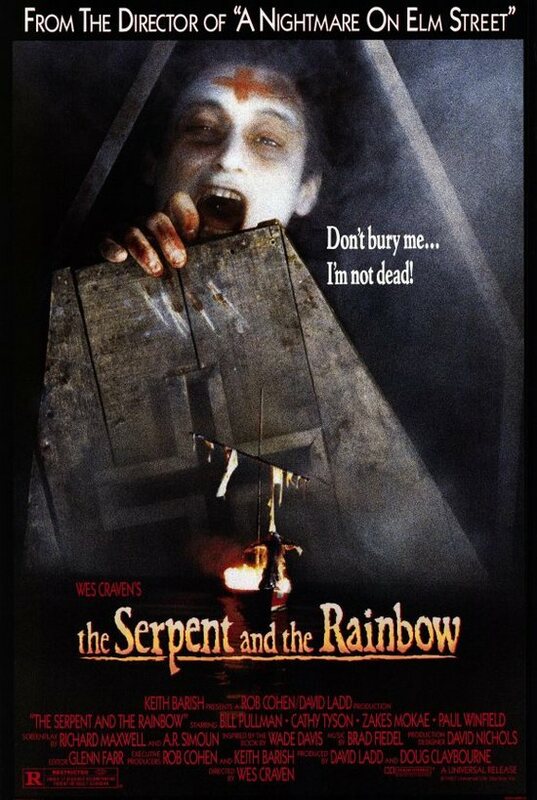 The Serpent And The Rainbow marked a major turning point for Wes Craven. He had been trying to break into the Hollywood system ever since the mid-’70s and, while he had a string of films to show for it, he had often struggled with meddlesome producers and executives on films like Swamp Thing and Deadly Friend. Things went a similar way on The Serpent And The Rainbow, right down to studio-mandated reshoots to beef up the finale, but he’d learned enough about playing the studio game to make a film that pleased the executives while also allowing him to do interesting and unusual things on Hollywood’s money. The Serpent And The Rainbow was adapted from a nonfiction book by anthopologist Wade Davis. The stand-in for the author is Dennis Alan (Bill Pullman), an anthropologist who is dispatched to mid-’80s Haiti by a pharmaceutical company in search of a natural drug that can be used to transform people into “zombies.” Working with local doctor Marielle Duchamp (Cathy Tyson), he discovers this legend is very much true. He also runs afoul of Peytraud (Zakes Mokae), the chief of the secret police who is also a powerful voodoo practitioner. Dennis is determined to bring the drug back to the U.S. but Peytraud will use all methods earthly and unearthly to stop him. The result is an intriguing blend of fact and fiction where the horror elements are act as the flipside to the factual elements of the story. The script by Richard Maxwell and A.R. Simoun features plenty of scary scenes and some reality-bending nightmare sequences right out of Craven’s A Nightmare On Elm Street playbook: there’s an effective, Altered States-esque opener where Dennis has to partake of a local drug, a voodoo show that goes wrong due to the interference of Peytraud and a great nightmare revolving around the fear of being buried alive. However, The Serpent And The Rainbow doesn’t just use the Haitian setting as a springboard for supernatural cheap thrills. The commercial scare moments often act as an allegorical representation of the real terrors of the Duvalier regime: there’s a memorable scene where Dennis awakens from a nightmare to have it clash with real life as he is accosted by the secret police and the finale has a voodoo battle happening against the backdrop of a political riot. Craven and the writers draw these connections throughout the film and it gives the scary moments a greater resonance than they would have otherwise had. It also helps that Craven had built up the chops to handle a Hollywood-size project by this time. Craven and cinematographer John Lindley do a beautiful job of capturing the visual scope of its third-world setting, capturing the beauty of the land and some haunting imagery of voodoo ceremonies. He also plays up surrealism rather than bloodshed in the horror scenes and gets nice performances across the board: Pullman makes a likeable everyman hero in an early lead role, Tyson creates a smart and resourceful heroine and Mokae is chillingly convincing as the vicious police chief. There are also strong supporting turns by Paul Winfield as Dennis’s main local contact and Brent Jennings as a voodoo priest who shows Dennis the art of the creating the zombie powder (he and Pullman have great chemistry in their scenes). Horror fans will also be amused to see horror vet Michael Gough playing a non-horror role as one of the pharmaceutical execs. Simply put, The Serpent And The Rainbow shows Craven pulling off the rare trick of successfully serving two masters. There are plenty of scares and creepy atmosphere to satisfy the executives and the horror diehards but the political themes and the convincing evocation of turmoil in Haiti give it a surprising depth. Craven would continue to have an up-and-down relationship with Hollywood after this film but his work shows he had developed the skills to stay in the game. Thus, this film is a necessity for Craven fans and worth a watch for anyone interested in the more unique Hollywood horrors of the ’80s.